Approximately seventy islands and skerries make up Orkney, with up to 20 of those inhabited. Most of the 21,000 strong population live on the largest island, the mainland, though many of the inner and outer islands of Orkney also support thriving communities, each with its own distinct identity. The Orkney capital Kirkwall - officially a city and Royal Burgh - is home to around 9,000 people, while some 2,000 live in the picturesque harbour town of Stromness, in Orkney's west mainland. The lush and fertile Orkney landscape supports a thriving agricultural industry, with production of high quality beef cattle the local speciality. Sheep and dairy farming are also key activities, with the bulk of locally produced milk being used by the islands’ acclaimed cheese and ice-cream makers. The clean seas around Orkney sustain a small but vital fisheries and aquaculture industry, with crab, lobster, scallops and salmon a particular focus. Orkney's many food and drink producers take their role as ambassadors very seriously, with quality and taste the bywords in an industry that has firmly established the islands as paradise for food lovers. In addition to the famed beef, lamb, salmon and shellfish, there’s the prized meat that comes from the legendary seaweed fed sheep of North Ronaldsay, along with cheese, oatcakes, fudge, beer, whisky, ice cream, wine and a multitude of other locally produced treats. 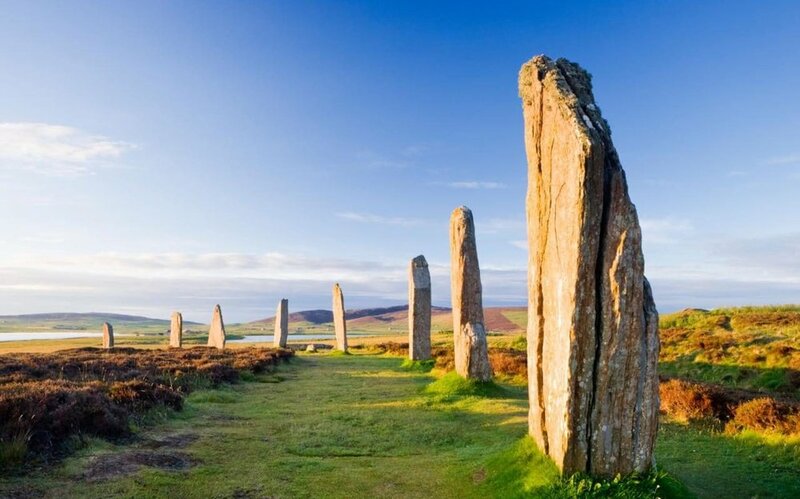 Given Orkney’s incredible scenery, abundant wildlife and mind-boggling wealth of archaeological sites, it’s no surprise to learn that tourism is also a hugely important industry in the islands. Tens of thousands of visitors enjoy holidays and tours in the islands each year and Orkney remains the top UK destination for cruise liners. The people of Orkney have always been practical, but with a real eye for the aesthetic. That could explain why the islands have the highest concentration of craft jewellers in the UK. Whilst many of the manufacturers draw inspiration for their work from Orkney’s landscape and history, each is unique and the variety of jewellery on offer locally is dazzling. Orkney's arts and crafts scene as a whole is a thriving one, with a huge number of businesses covering everything from pottery and woodwork, to textiles, knitwear, artwork and photography. Recent years have seen Orkney become an important international centre in the emerging renewable energy industry. Wind power, as one might imagine, is a long established technology in the islands, but now Orkney is also at the forefront of pioneering developments in wave and tidal energy. The European Marine Energy Centre, based near Stromness, is the world's first and only full-scale test laboratory for wave and tidal devices, attracting developers from around the globe. This new industry is already having a positive impact in the islands, supporting hundreds of jobs in the marine energy supply chain sector.